Oslo’s Royal Palace. A large amount of the buildings in this city seemed to painted in various shades of yellow. Almost neutral, but bright enough to give the city such life. The Palace leads directly into Karl Johans Gate, as seen in part one, if you can be bothered making that rather long walk. Most of it was closed due to the marathon, although we planned to head up to Vigeland Park anyway. It appears many can be! The grounds are covered in beautiful greenery, and a few small features along the way. Many messages were left hanging from this tree, in languages that trace back to all the corners of Earth. Not too shabby for the royal family to have in their garden. At home we have a small patch of grass and in my new house we have a roof to sit on, but not garden. So obviously the royal’s are jealous of me and my roof when all they have is this. Espresso House is a Scandinavian coffee chain that I never ended up trying in Norway, however I did get a Christmas filter coffee in Stockholm Arlanda airport, Espresso House earns it’s name. It was a cup of damn good coffee. Almost everything in Oslo is walkable. These are a few shots taken during our walk from the Royal Palace to Vigeland Sculpture Park, one of Oslo’s main attractions. Vigeland Park is located in Frogner, it’s a bit of a walk from the Palace, and there isn’t a whole lot of other attractions in the area, however we stopped at a good few shops on our way up to the park, so you can grab yourself some clothes from great Scandinavian stores like Moods of Norway, or bits of quirky homeware from Tiger. The main monolith in the distance. We’ll come to it in due time. The park can get pretty crowded, and it is, or was, a hotspot for Pokemon Go. I had a great time hauling in Squirtles, however a stampede of children nearly killed us. And all it was for was a Squirtle! I thought it was going to be a Dragonite! 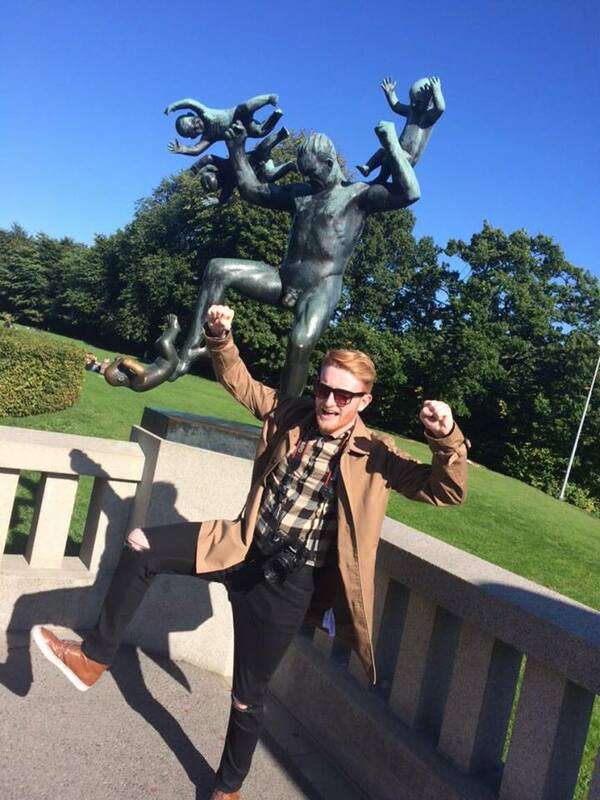 Vigeland park houses the many, many sculptures of Gustav Vigeland. All of humans, often in interesting and compromising situations- take the above for example. The wheel of life (Livshjulet). This one is the Babykicker. I think that title explains enough. It was a Saturday afternoon during an unusually warm September, meaning the park was completely packed. It was absolutely boiling this day, I expected mild weather, but it was scorching. Lots of suncream required for the gingers on tour. There it is, the monolith itself. The monolith is on it’s own plateau, on which 36 other statues lie. There are 8 separate entry gates around the monolith, it’s the true centre of the park! Ok some are a little creepy. Countless ‘us in the club’ jokes were made with reference to certain statues. Now prepare yourself for another spam of beautiful Scandinavian buildings. To finish the day, we stopped for a pretty lush burger and chips. This restaurant was called Grill’s Ville, in terms of how nice it was, it felt comparable to Nandos here in the U.K. You ordered at the desk, it has a classic chain restaurant feel, and whilst pleasant, doesn’t have the personality an independent restaurant does. Just to give an examples of the prices you will pay in Norway, this meal including drink was about £18. This is a lot higher than you’d pay in the UK, so be prepared for prices like this. Especially as this was considerably cheaper than other restaurants. We walked back via Karl Johans Gate and found a little Alfred Nobel, and there I leave you. For we resume on part 3!